This entry was posted in LIFE Business and tagged chris brady, Leadership, life leadershio, Life Leadership, nerds, Orrin Woodward, scam. Bookmark the permalink. Thanks, Chris, I have a smug satisfaction in this moment that, I, too, drink of the kool-aid so-to-speak and enjoy association within the most excellent field of Network Marketing-gone ROGUE with community building- people lifting- truth telling- hungry student feeding- and best of all – the opening of eyes and hearts to hope again. Best scam EVER! Is that Theresa, as in Mother Teresa? I use to pride myself on not reading a full book in school up through my 4 year degree in business college. Then 9 years ago someone told me of the Life leadership business. I now read 1-2+ full books a month in areas that help develop me to be a better person. We enjoy more lifestyle, time together as a family (and not at a job), travel around the world and have more peace of mind and quality of life than I ever thought I would have. We can’t wait to grow our selves and our business more and help others get the life they have always wanted via the Life leadership business. Chris, great article and I am so enjoying this book by Orrin! I also wanted to thank you and LIFE Leadership for a tremendous weekend in Milwaukee(Canada and Cali, also)! Especially your talk Saturday night was excellent. I so wanted to get alone with you in a quiet area and really flesh out some of the thoughts you were conveying. You were explaining in a better way what I have been thinking for a long time, now. I can hardly wait for that CD to come through. I truly hope you dig deeper into what you communicated that night in another seminar(maybe if you are coming to St. Louis soon) so we have some more audio on the topic of destiny along the lines of your talk. Great post Chris! I’m excited to hand this book out to friends and recent high school or college graduates. I liked those R. of N. movies too. Once again your blog has me laughing out loud! Thank you, Chris! 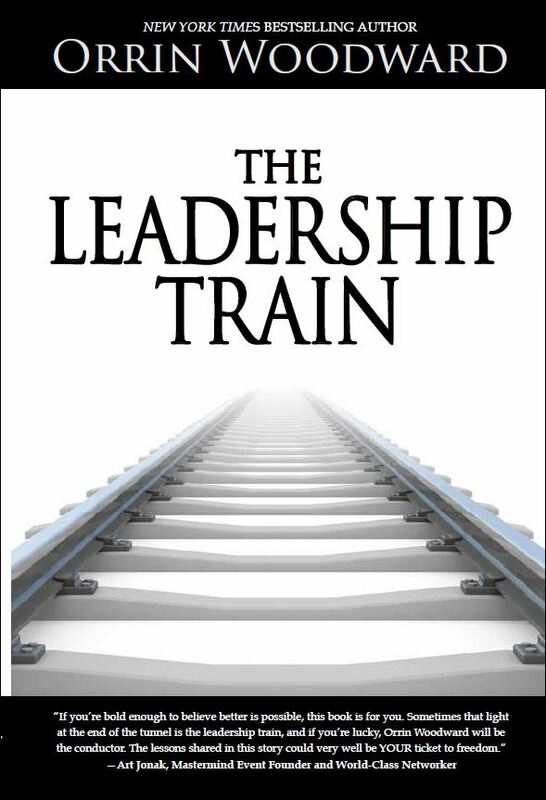 From my involvement in LIFE since its launch in 2011 I have never anticipated a book as much as I have Orrin’s “Leadership Train”. I can’t wait to read it and I am so excited for the truth provided through the life-changing-LIFE business! Written as a novel with interesting characters and real life questions about the profession in general and Life Leadership in specific, the book is so much fun that I read it in one sitting! This book really put network marketing together in a easy read and understanding way for me. This is why I pulled my ladder of the corporate wall and started onto the team approach staircase. This book will be yet another best seller for Orrin Woodward. Chris, with the advent of the ‘virtual bathroom wall’, the internet and google, people really have to learn discernment of what is true or untrue. You know and I know that it is actually a good sign that some people feel compelled to write that life leadership is a scam on this bathroom wall. If we are not ruffling a few feathers, then we are not doing anything significant! Thanks for a great post and for being a leader worth following!